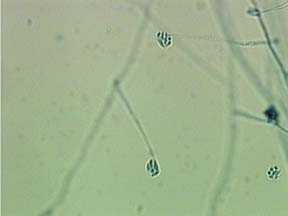 Species of Acremonium are recognized by solitary to weakly branched, tapering phialides arising from vegetative filaments and bearing a wet cluster of mostly 1-celled spores (conidia). The filaments are sometimes bound together into “ropes” several cells in diameter. Some appear to be parasitic on living fungi. Sequence characteristics of this imperfect fungus are of great interest as prerequisite for the improvement of antibiotic biosynthesis. Acremonium, under certain conditions, can also produce very potent mycotoxins called trichothecenes. The trichothecenes are potent inhibitors of DNA, RNA, and protein synthesis, and have been well studied in animal models because of concern about their potential misuse as agents of biological warfare, due to their ability to destroy the immune system, internal organs, bone marrow, and affect the mind. They are a known carcinogen. The most common characteristic of this fungus is a horrible stench in the air. This fungus is often associated as an aftermath of stachybotrys chartarum. It was the primary fungus identified in several homes where the occupants complaints were nausea, vomiting and diarrhea. 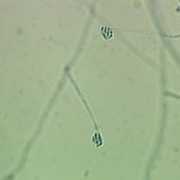 Asexual state of Emericellopsis sp., Chaetomium sp, and Nectripsis sp. It can produce mycetomas, infections of the cornea and nails.